I’ve been having a great summer and no small part of that has been surfing in Montauk, Long Island. What can I say – cliches abide: catch a wave and I absolutely feel like I’m sitting on top of the world. But beyond that Leo DiCaprio-esque element, the rest of the ritual is also seriously cool: zipping up the superhero wetsuit, the graceful paddling, the hours bobbing in the ocean, the way the water catches and cradles you when you leap from your board (well, that last one can be wishful thinking.) For some reason, Liev Schreiber and I are on the same surf schedule. We’ve ended up in the third parking lot at Ditch Plains at the same time for three mornings now, and we chit chat about the wave quality as we squint our eyes and look out to sea and pretend we’re not scared as we slather on sunblock (best surfing sunblock is Headhunter– does…not…come…off) and suit up for a session, one rad athlete to another. As I said, cooool. 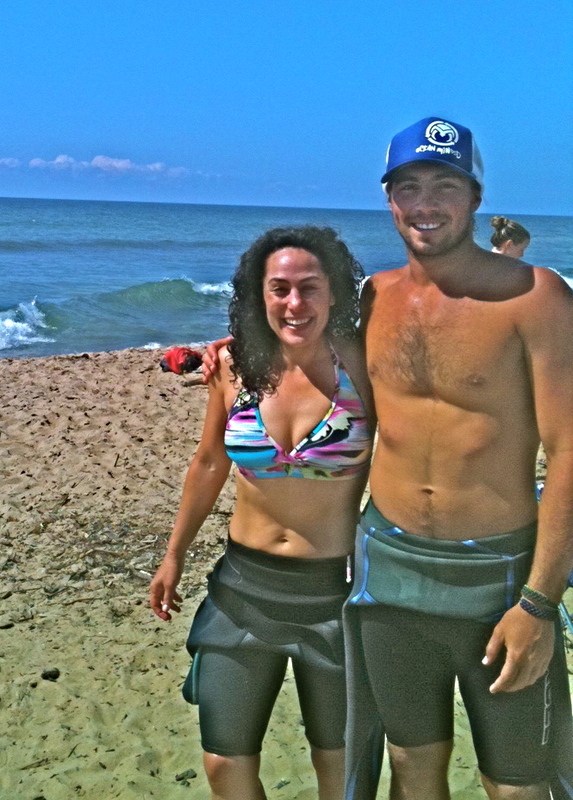 That mellow (HAPPY) post-surf glow...me and John from CoreysWave. Part of my happiness out there on the Montauk waves stems from finding great teachers. I stumbled upon Corey’s Wave surf school, and have now surfed with Corey himself and also John Anglulovitch. They combine fabulous instruction with a lot of care and focus. This is important as feeling safe is 90% of the game – if you’re tense and not relaxed not only will you not have much fun but your stance will be stiff instead of fluid. Surfing is about letting go, not tightening up. Breathing. Smiling. Panic – and it does creep up – will only hinder you, so the calm and confident presence of these guys is priceless for me. There’s a leap between being able to get up on the board and being able to cut and turn and line up with peak of the waves..and this dog, baby, is finally learning some new tricks! Woo hooooo! A guy in the water said to me last week, “I’m just beginning but clearly you’ve done this before,” and I wanted to hug him. I want to shed the training wheels and take off with friends sans instructor by the end of the summer, but I am not there yet. Here’s another lesson from surfing – love where you are. No matter what your level is, it’s a thrill. Words can’t really do it justice…all I can say is jump in. Corey’s Wave lessons are 1 1/2 hours and they provide a surfboard and wetsuit. Prices are $150 for private lessons and $100 per person if two people share. (Expensive, true, but the experience is so unique and special. Nice rationalization, no?) I find sharing is great – one person paddles back out while the other catches a wave in to shore, so there is more than enough action to go around. Corey’s folks matched me with a surfer my level and we had a blast. So if you’re a newbie or someone who has already gotten her toes wet, like me, go for it! And let me know – always looking for surf buddies. xxxoo One more thing: Click here for my pick of the cutest rash guards and surfer shorts. Love love love. What I like about surfing is that what you said – about letting go, not tightening up. Breathing. Smiling. To be able to do it, you gotta be cool. Great pictures!